Welcome back to my blog! I am happy to have a visit from my friend Beth today. She has brought a really fun animal collection to share! You may remember Beth from her previous visits to tell her cat Scotty's dramatic rescue story and to share the story of her beautiful bunny rabbits, Cadbury and Woodbury. Abby: Thank you for visiting, Beth! I heard you have a wonderful whale collection. How did you get interested in whales? Beth: I fell in love with whales the summer before I turned 15, when my parents took me to Hawaii for our vacation. Whales seemed so beautiful and majestic to me. I'm interested in every kind, but I think my favorite is the humpback whale. Abby: They are really beautiful! What whale treasures did you bring to share? Beth: Here are the whales in my glass front cabinet. These are in our "beach bathroom." Abby: Beth, thank you so much for visiting! I love your whale collection. Your cross-stitched picture is especially beautiful! They are all so beautiful! Beth, thank you again! I really enjoyed your visit today. Friends, if you would like to leave a message for Beth, you can do so in the comments below. If you would like to share pictures of your animal related collection, please let me know (with your email). Do opposites really attract? John and Nora might just be the perfect match. 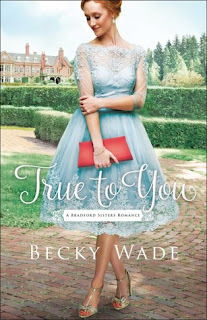 Find out in True to You, book one in Becky Wade's new series! Genealogist and historical village owner Nora Bradford has decided that burying her nose in her work and her books is far safer than romance in the here and now. Former Navy SEAL and Medal of Honor recipient John Lawson is a modern-day man, usually 100 percent focused on the present. But when he's diagnosed with an inherited condition, he's forced to dig into the secrets of his past and his adoption as an infant, enlisting Nora to help him uncover the identity of his birth mother. Finding the answers they're seeking will test the limits of their identity, their faith, and their devotion to one another. Nora Bradford is a genealogist who runs a historical village. She meets John Lawson, a former Navy SEAL who wants to find his mother to find answers about a new health concern. They seem like opposites, but find much in common through a growing friendship and shared faith. John already has a girlfriend, and Nora is wary of relationships after a heartbreak three years ago. Will they find a way to make romance happen? I loved this book! Nora was a character that I truly liked - and related to. She is the kind, smart middle sister in her family, unlike her creative and beautiful older and younger sisters. I really liked the family dynamics in this book as well. John is also such a strong and sympathetic character. I admired him, and also really was pulling for romance between Nora and John! I liked Nora's fascination for a Downton Abbey-ish series, and the way it played into the story. I enjoyed the way the chapters ended with texts and Facebook messages. I found the genealogy and mystery of John's mother very interesting as well. I loved seeing Nora and John work together to solve the mystery as their connection deepened. 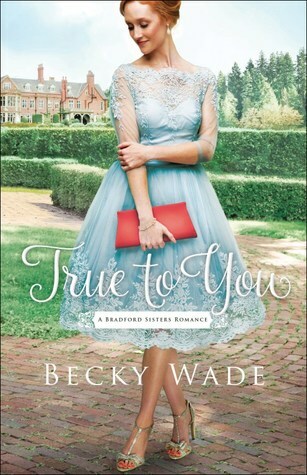 True to You is the first book in a new series, A Bradford Sisters Romance. I am already looking forward to the next books in this series. This was a delightful, well written novel with characters I really cared about. I can't wait to read more! Recommended for fans of women's fiction, contemporary romance, and Christian fiction. Celebrate the launch of Becky Wade's new series by entering to win a fabulous prize pack and $100 cash card!